Queensland Health aims to ensure that all interpreters used by the Queensland Health Interpreter Service adhere to the highest possible quality standards. The Queensland Government Language Services Policy states that National Accreditation Authority for Translators and Interpreters (NAATI) accredited or recognised professional interpreters should be used and that non-professional interpreters should not be used unless the situation is urgent and a professional interpreter is unavailable. Queensland Health requires that all interpreters engaged by the Queensland Health Interpreter Service abide by the Australian Institute of Interpreters and Translators code of ethics. Queensland Health encourages staff and clients to provide feedback on the quality of interpreter services provided by the Queensland Health Interpreter Service. In 2012, a review of client experiences of the Queensland Health Interpreter Service was completed. The results of the survey indicate that the service is well placed as a quality service in terms of its capability, appropriateness and accessibility. Queensland Health also supports training programs for interpreters who wish to improve their skills in interpreting within a general health context and within a mental health context. Queensland Health's preference is to work with interpreters who have participated in this training. 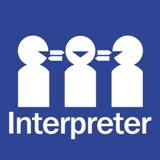 NAATI accredits interpreters whose language skills have been reviewed and certified as meeting the official requirements to operate as a professional interpreter, usually by way of an exam. The assessment tests interpreting skills, as well as the candidate's knowledge of the code of ethics. NAATI has responsibility for setting and maintaining the standards of interpreting and translating in Australia. For new languages to Australia, a language test for accreditation as an interpreter may not be available. NAATI has organised testing that is based on English proficiency and people who pass this testing are awarded NAATI recognised interpreter status.